Soulpepper is committed to protecting the confidentiality of its patrons' personal information. Recent legislation in Canada has helped to protect you from disreputable practices. For more information about this law, please visit the office of the Privacy Commissioner of Canada at www.priv.gc.ca. We will always do our utmost to ensure that the information you share with us is correctly recorded, securely maintained and used as per your wishes. 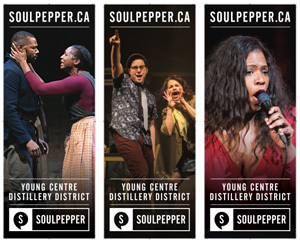 The information you provide will be used to keep you up-to-date on Soulpepper's activities including opportunities to donate or to volunteer. Soulpepper does not sell its mailing lists. Occasionally we exchange information with other cultural organizations that we feel may be of interest to you. Our current outdoor street banner campaign features photos of Dion Johnstone and Lisa Berry, Gregory Prest and Raquel Duffy, and Alana Bridgewater.